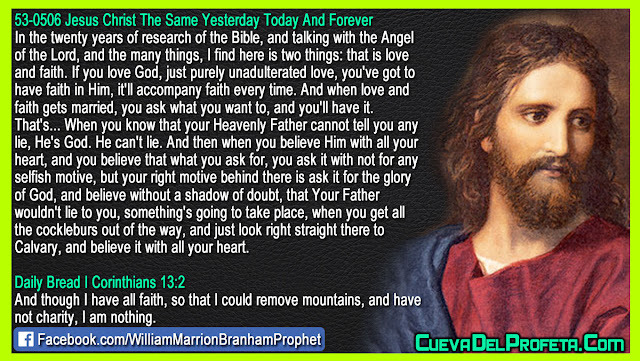 In the twenty years of research of the Bible, and talking with the Angel of the Lord, and the many things, I find here is two things: that is love and faith. If you love God, just purely unadulterated love, you've got to have faith in Him, it'll accompany faith every time. And when love and faith gets married, you ask what you want to, and you'll have it. That's... When you know that your Heavenly Father cannot tell you any lie, He's God. He can't lie. And then when you believe Him with all your heart, and you believe that what you ask for, you ask it with not for any selfish motive, but your right motive behind there is ask it for the glory of God, and believe without a shadow of doubt, that Your Father wouldn't lie to you, something's going to take place, when you get all the cockleburs out of the way, and just look right straight there to Calvary, and believe it with all your heart.